We understand that buying camera gear is a process with a lot of considerations, and we want to give you the best information possible. Our ratings are based on the price, overall product value, and customer reviews. We also asses the general reputation of each product and aim to offer accurate and honest opinions. Below is a breakdown of the top three criteria we used to rate our top Fuji lens picks. Price: When looking at a new camera lens, it is very easy to fall in love with an expensive product. While that may be a reasonable purchase for some, others may be looking for a less expensive, but still comparable option. Product Value: Fuji lenses have a variety of price points, but just because a product is inexpensive does not mean it cannot provide excellent value. When determining value, we take into account all the different functions of a lens. Customer Reviews: Opinions from individuals who have used a product previously are incredibly helpful in deciding on a purchase. We hope the information below helps you feel confident in your final selection. Let’s dive into our picks for top Fuji camera lenses. This list covers a wide variety of lenses and includes both prime and zoom options. The Fujifilm XF 18-55mm f2.8-4 is a solid all-purpose zoom and is an excellent starter kit lens. 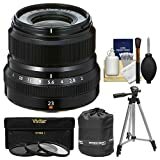 The range of this lens goes from wide-angle to mid-telephoto, which allows for the capture of a variety of scenes, including portraits, street photography, cityscapes, and group shots. It is compact and versatile, making it an ideal option for day-to-day shooting. This 18-55m zoom also features a fast, linear autofocus system that operates smoothly, as well as optical image stabilization that helps compensate for any camera movement. Ultimately, this is a really versatile piece of equipment that provides surprisingly good quality images. The Fujifilm XF 35mm f2 is a solid prime lens that offers a standard visual perspective. The autofocus system can lock onto a subject in 0.08 seconds with near-quiet and smooth performance. It is also an excellent choice for low-light conditions and the fast aperture is useful for composing shots with a shallow depth of field. This 35mm requires a minimum working distance of 13” and is a great first prime lens to add to your kit. The Fujifilm XF 10-24mm f4 is an ultra-wide zoom that is well-suited for big group shots, expansive landscapes, and large architecture. It also features precise focusing and optical image stabilization that works well in both still and video uses. This would be a good option for a secondary zoom lens in a camera package, but note that it does not feature weather sealing, so use in damp or dusty conditions could damage the lens. 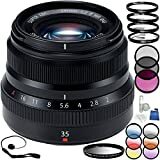 The Fujifilm XF 16mm f/1.4 is a wide and fast lens with an autofocus motor that can find a subject in 0.11 seconds while maintaining a quick and quiet motor. 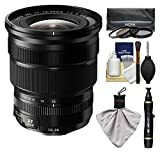 This lens is weather sealed, which makes it suitable for dusty or damp conditions and is an excellent choice for travel, street, and landscape photography. This 16mm lens has a minimum working distance of 6” and is a good fit for shooting close-up subjects, making it a reliable secondary prime option for your kit. The Fujifilm XF 23mm f/2 is a compact and fast lens with a minimum working distance of 9”. It offers a 35mm equivalent perspective and has a lightweight design that allows you to stay discreet while shooting photos. This 23mm is a great choice for street photographers who are looking to capture in-the-moment candid shots. It is also weather-resistant and constructed to minimize lens ghosting and flare. With an autofocus motor that can lock on a subject in 0.05 seconds, this is a great prime lens for travel and street captures. The Fujifilm XF 50mm f/2 is a telephoto prime lens with a 76mm equivalent focal length. If you are looking to shoot portraiture and still life photos, this is an excellent addition to your camera package. This 50mm lens is lightweight and features a weather-sealed design that can work in damp, dusty, and below freezing temps. The aperture works well in challenging lighting conditions, and the fast and quiet autofocus is great for both photo and video shooting. Overall, a solid prime option for expanding a lens kit. The Fujifilm XF 50-140mm f/2.8 is a telephoto zoom lens. It features an optical image stabilization system and is best for shooting distant subjects and portraits. This 50-140mm zoom also performs well in difficult lighting conditions, and is weather sealed for a variety of shooting conditions. The design also allows for shallow depth of field techniques and the nearly silent zoom is an excellent feature for noise-sensitive situations. This specialty lens should definitely be an add-on to a pre-existing lens package unless your main interest is shooting sport, wildlife, or action photography. The Fujifilm XF 16-55mm f/2.8 is a versatile lens that is great for a wide variety of environments and skill levels. This zoom lens is able to go from wide-angle to portrait focal lengths and features a very fast and quiet autofocus motor with speeds as fast as 0.06 seconds. This makes it an excellent choice for filming in noise-sensitive areas. The 16-55mm lens is also weather sealed and performs well in harsh weather conditions. This is a great lens to add to any kit, but the price point makes it worth further consideration if you already have a solid zoom option. The Fujifilm XF 90mm f/2 is a fast telephoto prime lens with excellent low light performance. It features a precise, quiet, and quick autofocus that makes it a solid lens for fast-paced shooting. Portrait photographers will love the control it has over focus placement, and it is also well-suited for capturing details in landscape and architecture. This 90mm is sealed against the weather and is a solid option if you are looking to continue building a set of prime lenses. The Fujifilm XF 100-400mm f/4.45-5.6 is a super-telephoto zoom lens with a 150-600mm equivalent range. It is weather-sealed and features a five-stop optical image stabilization system. The fast autofocus and extremely long reach are great for capturing wildlife, sporting events, and far away subjects. 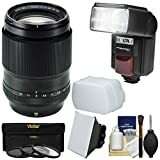 This lens is definitely the most specialty option on the list and is a fun secondary long zoom to have on hand if you love photographing outdoor action shots. Primary Use. Whether you are a hobbyist or a professional photographer, it is important to select the proper style lens for your photography needs. For example, action wildlife shots require different tools than landscapes and portraits. Before committing to a lens purchase, make sure you are considering lenses that match your needs. 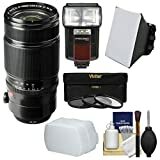 Existing Lenses in Your Camera Kit. To build off the previous tip, take a look at your existing camera package to see what lens types need the most upgrading. If you have a solid zoom lens, focus on selecting a prime or super-telephoto option to add options to your package. Budget. Camera tools and toys can add up very quickly. As with most big purchases, decide your budget before shopping around so you avoid falling in love with the perfect lens that is just outside your budget. Weight and Size. These are two elements that are easy to overlook in the buying process, but definitely come into play when you are carrying all the gear around. Size also factors in when buying other lens accessories such as filters. Choosing to purchase a smaller lens could mean saving money on additional accessories down the road. Weatherproofing and Autofocus. These are both elements that tend to scale up in quality as lenses get more expensive. Selecting a lens with a good quality autofocus motor may be pricier, but they tend to be faster, quieter, and are built to last. Furthermore, if you plan to take photos in dusty or wet conditions, weatherproofing is an important quality. Hopefully, this list of some of the best Fuji lenses was helpful for choosing your first or next camera lens. No matter what you decide, have fun and enjoy the process!